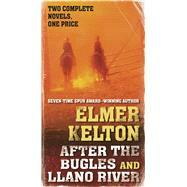 Two novels from seven-time Spur Award–winning author Elmer Kelton, "truly a Texas legend" (former Texas Governor Rick Perry), After the Bugles and Llano River. Joshua Buckalew has left behind the deserted battlefields that claimed his brother Thomas. The war with Mexico has cost him much, but it has also given him a strong bond to the land and to the Mexican families who stood with him against the tyrannies of Santa Anna. Josh is travelling with Ramon Hernandez, his best friend and the man who had fought with him. Where they are going, he isn't quite sure. His home is in ashes—burned by either the retreating Texans or the advancing Mexican Army—and the land is full of bandits and opportunists who would happily shoot Ramon simply because he is Mexican. Exiles in the land they had fought to liberate, Josh and Ramon struggle to rebuild their lives after the bugles. When former cattle man Dundee wanders into the town of Titusville, he's broke, tired, and itching for a fight. Instead, he gets a job offer from none other than the top man in town, John Titus. Titus recruits Dundee to find out who's rustling his extensive herd of cattle. But for Titus, it isn't enough that Dundee find the missing cattle. He wants to place the blame on a specific person: Blue Roan Hardesty, a one-time friend turned sworn enemy of the powerful Titus clan. All Titus needs is hard proof, and Dundee is just the man to get it. ELMER KELTON (1926-2009) was the award-winning author of more than forty novels. He grew up on a ranch near Crane, Texas, and earned a journalism degree from the University of Texas. Among his awards have been seven Spurs from Western Writers of America and four Western Heritage awards from the National Cowboy Hall of Fame. The Good Old Boys was made into a television film starring Tommy Lee Jones. In addition to his novels, Kelton worked as an agricultural journalist for forty-two years, and served in the infantry in World War II. He died in 2009.